Jude 1:3-4 "Beloved, while I was very diligent to write to you concerning our common salvation, I found it necessary to write to you exhorting you to contend earnestly for the faith which was once for all delivered to the saints. 4 For certain men have crept in unnoticed, who long ago were marked out for this condemnation, ungodly men, who turn the grace of our God into lewdness and deny the only Lord God[a] and our Lord Jesus Christ." The purpose of this article is to call for more discernment according to scripture for God's glory amongst all Christians . 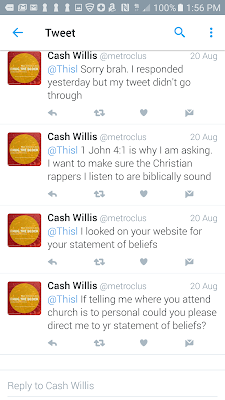 With numerous people claiming to be Christians and making music about Jesus Christ, it seems nobody is asking and checking Christian musician's beliefs in light of scripture like 1 John 4:1. Has Christianity become so shallow today that in order to be promoted at a church all I have to say is "I believe in Jesus"? 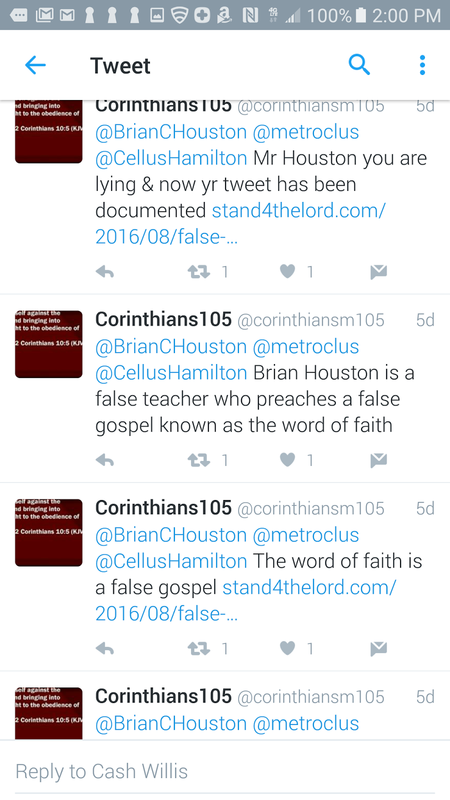 In other words, as long as I believe in a "Jesus", it does not matter whether I believe in the true Jesus of the Bible? 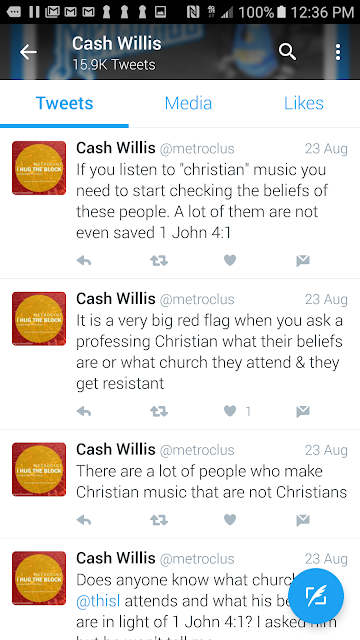 Whether people like it or not , there are essential beliefs(beliefs that one cannot deny) in order to be a Christian. The Jehovah Witnesses, Mormons, Catholics etc would claim they believe in Jesus but the problem is they believe in a false Jesus- not the Jesus of the Bible. Jesus was clear in John 8:24 " "Therefore I said to you that you will die in your sins; for unless you believe that I am He, you will die in your sins." Your faith is only as good as who you put it in. 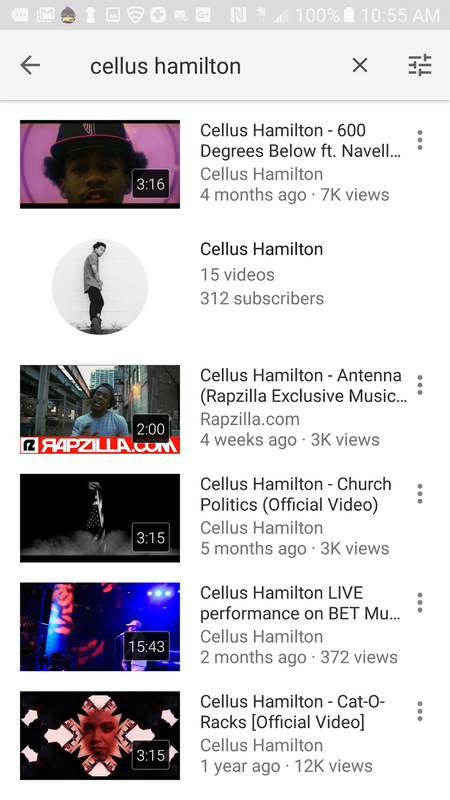 Cellus Hamilton is a rapper I discovered while browsing the website Holy Culture. 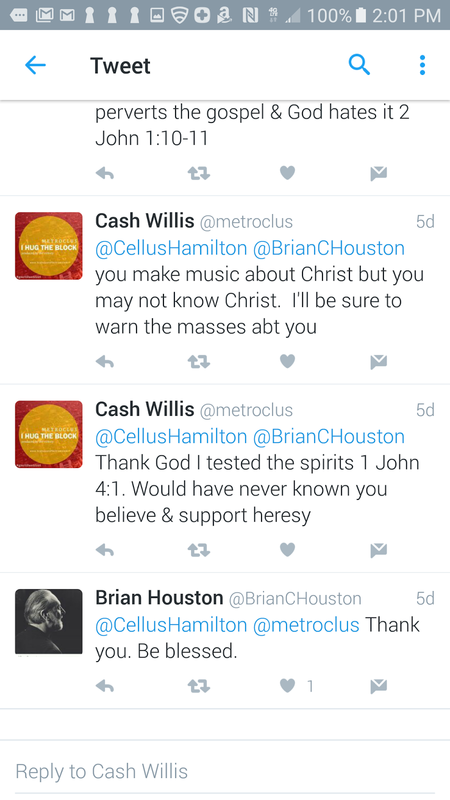 I listened to his music and it seemed to be glorifying Jesus Christ. However, in light of 1 John 4:1, I wanted to know what his beliefs were and what church he attended. 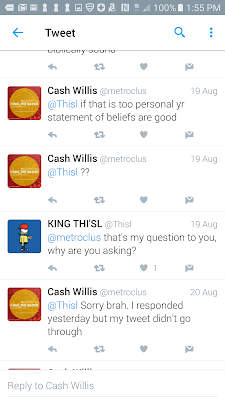 I contacted him on twitter. 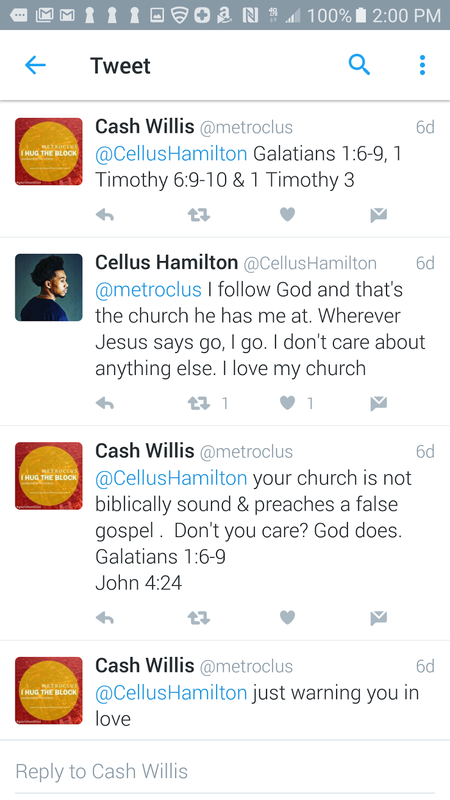 As you can see Cellus Hamilton believes and defends a false gospel. 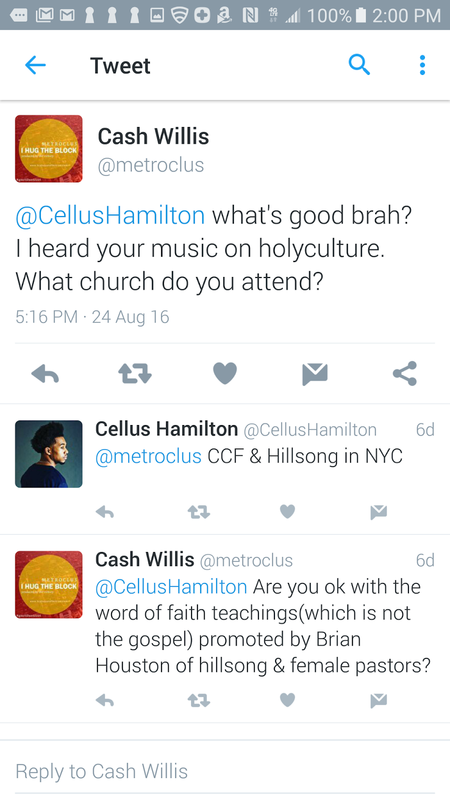 He attends Hillsong which is a false church that spreads a false gospel known as the "word of faith" and also ignores God's instruction on how the church is to be run by ordaining women as pastors in direct violation of scriptures like 1 Timothy 3. 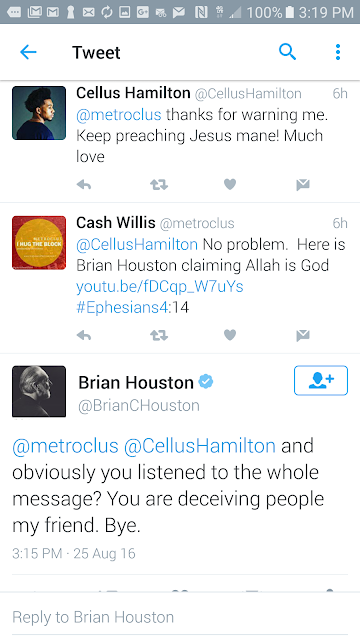 Hillsong is led by false teacher Brian Houston. 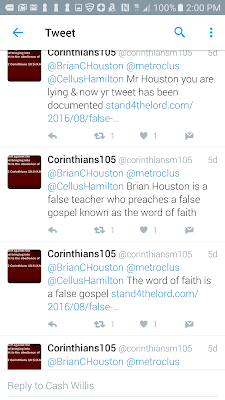 The gospel is an essential belief - Galatians 1:6-9 and there being only one true God(triune) is an essential belief - Isaiah 43:10. 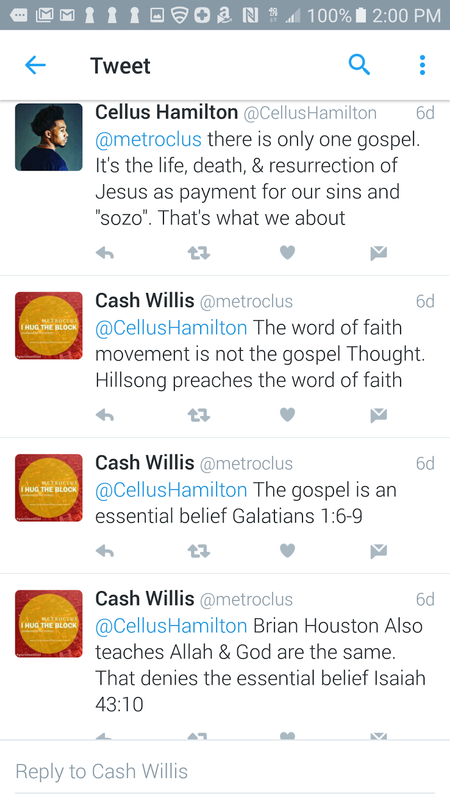 You cannot deny these essential beliefs and be a Christian. The word of faith( the "prosperity" gospel or name it claim it) is NOT the gospel. God warned about such a false message in 1 Timothy 6:9-11. Women are not called to pastor. 1 Timothy 3 clearly shows this. 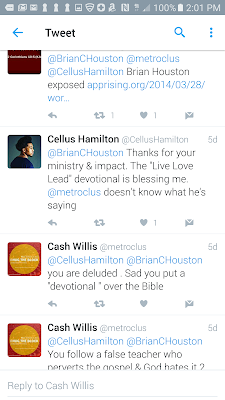 All these scriptures were given to Cellus and yet he refused to repent and even went as far as claiming I did not know what I was talking about defending Brian Houston a man who leads people to hell apart from God. Rapzilla and HolyCulture promote Cellus Hamilton's music. Did they check his beliefs in light of scripture and what church he attends and if they agree with his beliefs are they truly Christian? This is a huge problem. 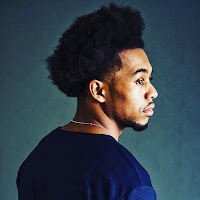 Remember Jahaziel? 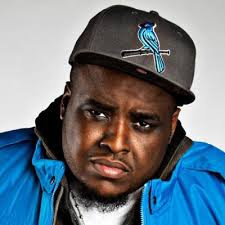 He claimed to know Christ and rapped about Christ but now has walked away from the faith showing he never truly knew Christ to begin with(1 John 2:19). 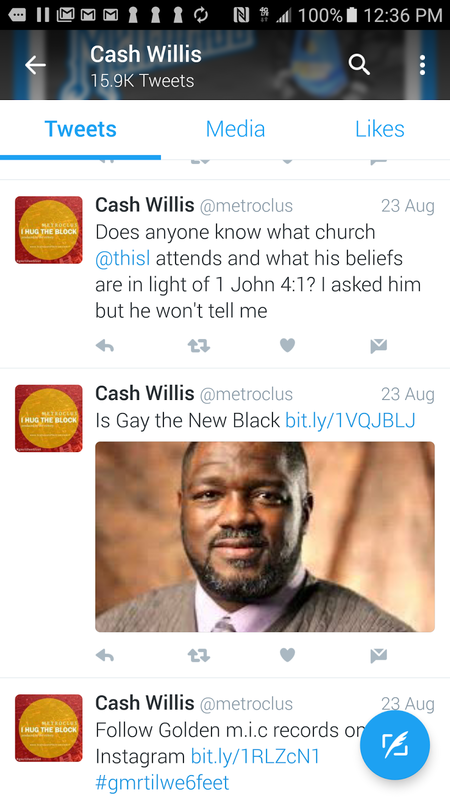 When people were promoting him, did anyone check his beliefs and what church he attended to see if he truly believed the essentials? 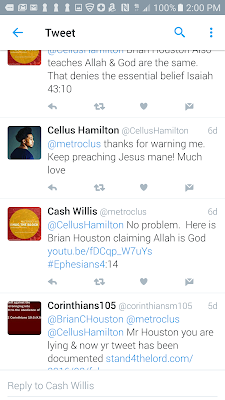 Cellus Hamilton is deceiving many. 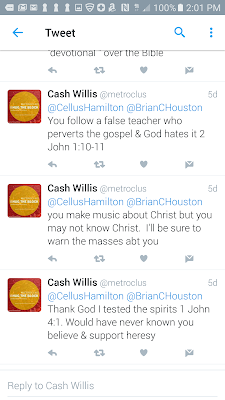 Cellus I encourage you to repent and believe the true gospel while God has given you time. 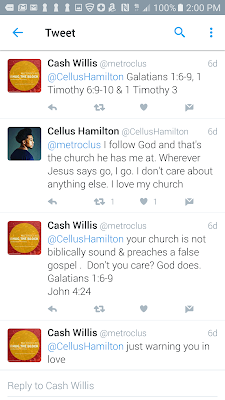 I do not encourage anyone to follow Cellus because he defends and promotes a false gospel that will lead you to hell apart from God. 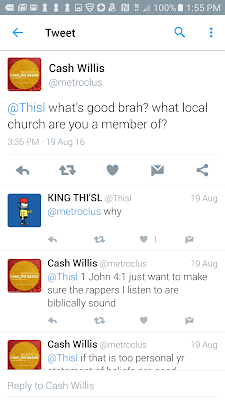 I have listened to this'l's music and heard him rap about Jesus Christ. 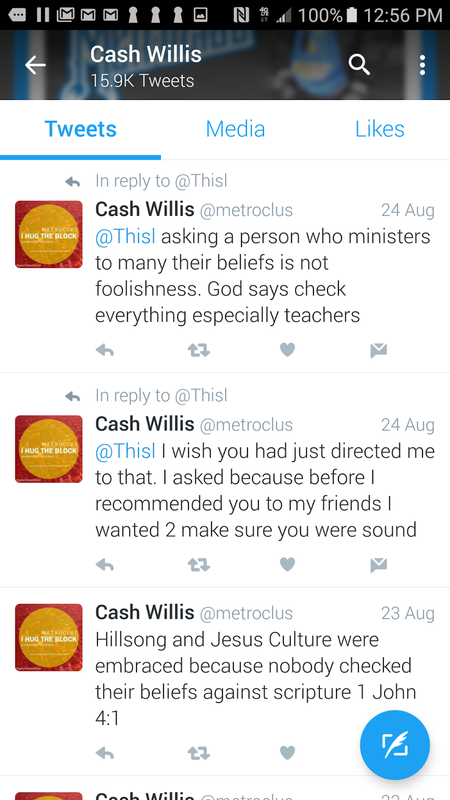 However, I did not know what his beliefs were on the essentials and what church he attended. 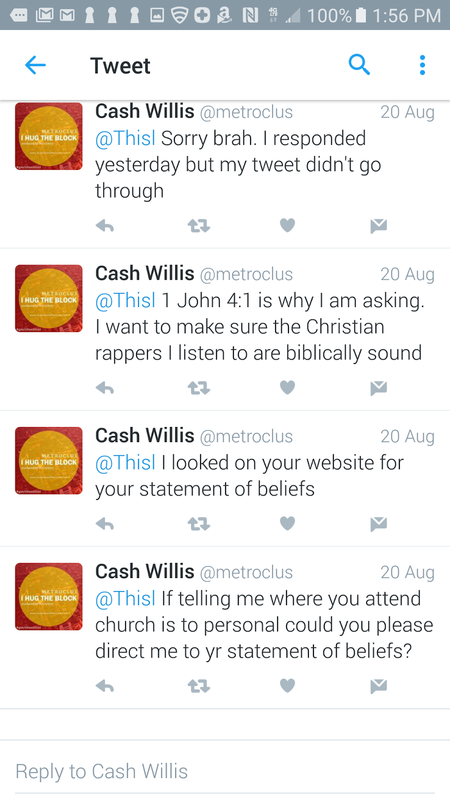 I went to his website to see if he had a statement of faith . I did not find one. His website is http://www.iamthisl.com. As you can see This'l - a professing Christian refused to answer my questions based on scripture on what he believed. 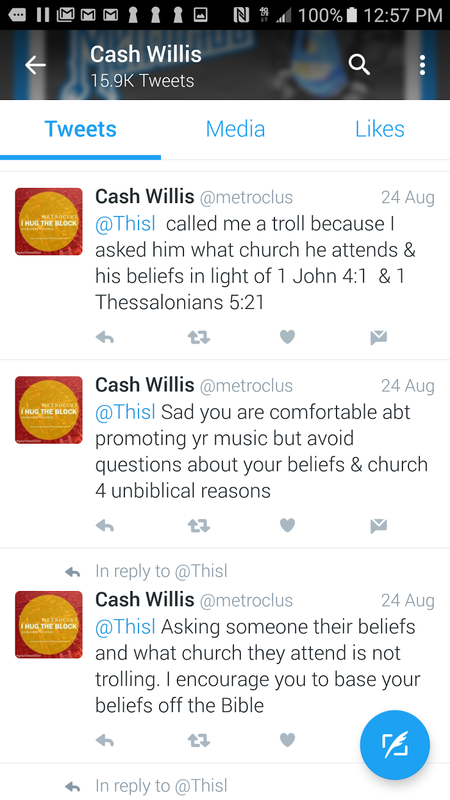 This'l's reasons for not answering my question was not biblical. 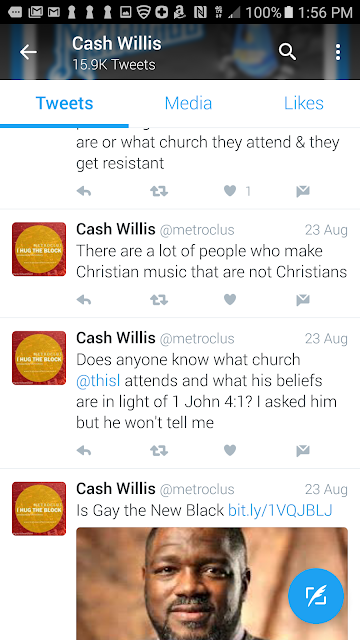 How is that one can profess to know Christ and make music about Christ but when asked what your beliefs are in light of scripture by some sincerely attempting know you brush them off because you are not a "church"? Something is wrong. I pray This'l is led to repentance. 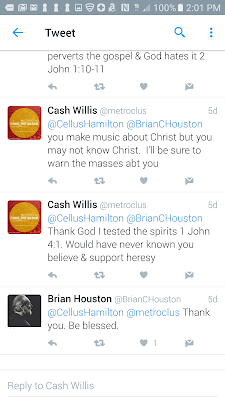 As of today, I do not truly know if he affirms the true Jesus Christ of the Bible and what church he attends to test and know if he is of the faith. 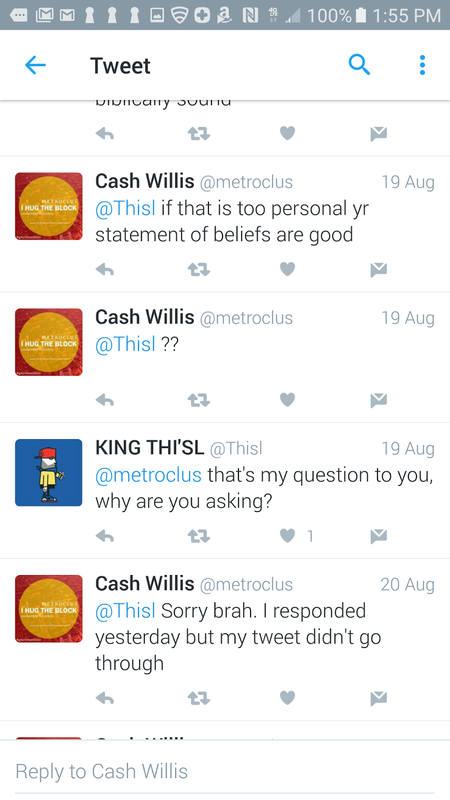 He dodged direct questions pertaining the issue. 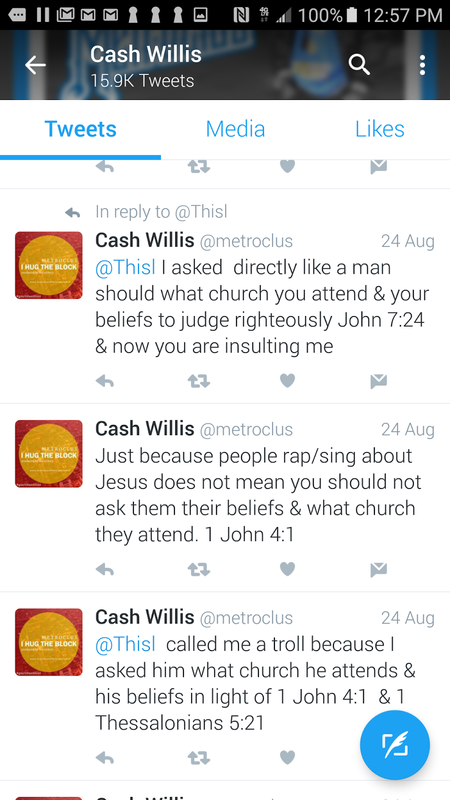 What is sad is this man goes around speaking and preaching in addition to his music. 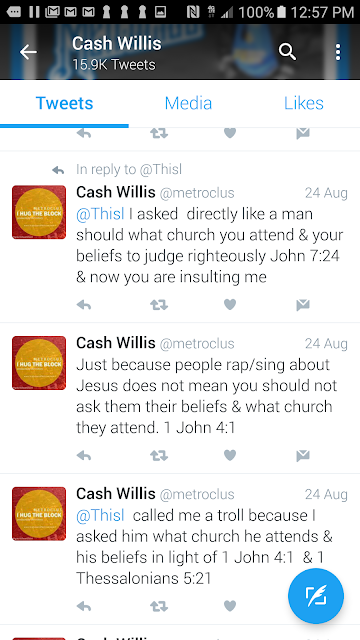 The people that invite him, have you guys tested to see if he in the faith ? God calls us to discernment and to be extremely critical of things concerning him - 1 John 4:1, 1 Thessalonians 5:21. Jude 1:3-4 is very clear on contending for the faith and shows how we are to be on guard in the church. 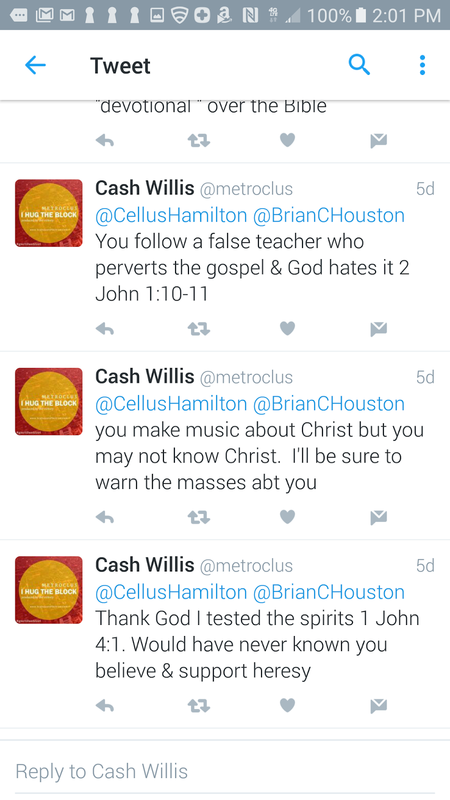 How come when it comes to Christian music professing Christians do not check to see if the person they are listening to is truly of Christ? It matters. Many so-called Christian websites are promoting these acts but not checking their beliefs. 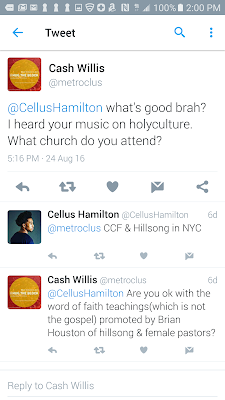 We see this in Christian Hip Hop with false Christian rapper - Cellus Hamilton and in other Christian genres with heretical groups Jesus Culture and Hillsong. 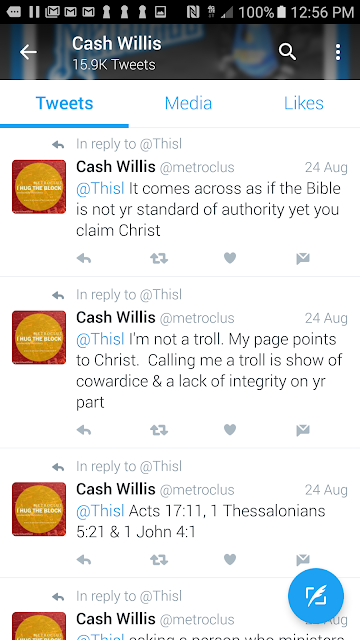 This'l is very suspect because he denied direct questions about the truth of scripture. If you know him call him to repentance and ask him to provide his beliefs if indeed he is of Christ. 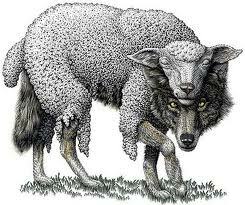 As Christians, it is not only the responsibility of Pastors to guard the flock. We have a responsibility too. 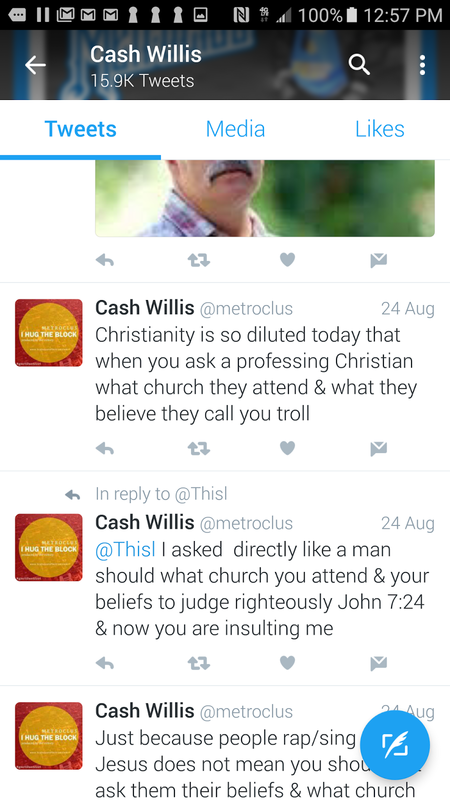 We need to be on guard against heresy and apostasy in our midst as the book of Jude shows. 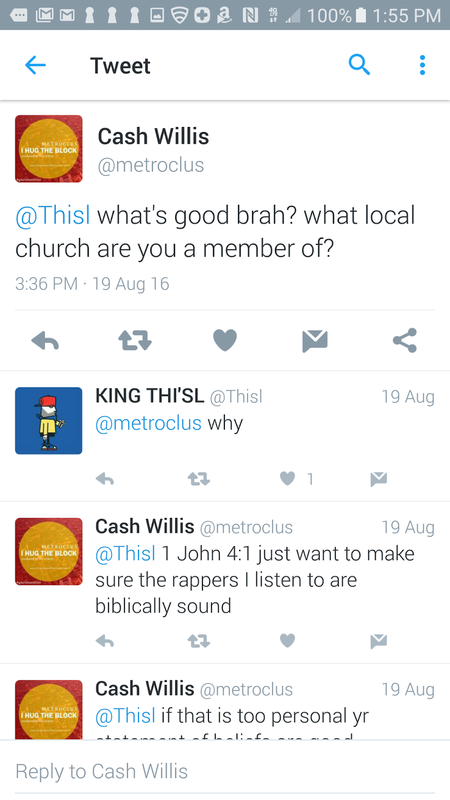 Rapzilla, HolyCulture , Churches etc everyone needs to do better in testing against scripture for God's glory. 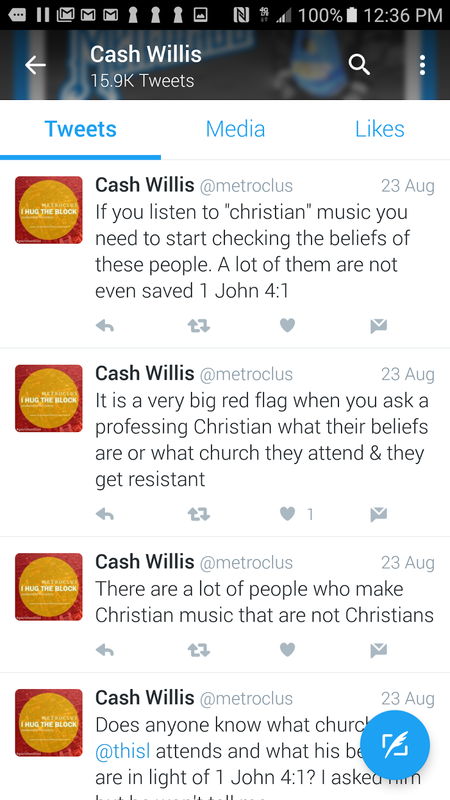 Next time you listen to your favorite "Christian" artist, inquire to see if they truly hold to the essential beliefs of a Christian. 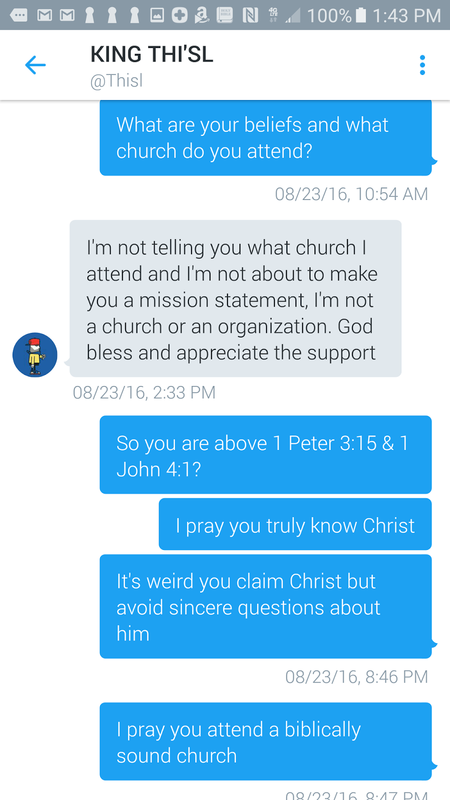 Who is letting these wolves in the church? People promoting these acts without checking their beliefs, are you doing this for Christ or personal gain? John 3:20 "For everyone who does evil hates the Light, and does not come to the Light for fear that his deeds will be exposed."